Frontier warfare was brutal and brutalizing. When the native tribes allied themselves with the British during the American Revolution in a desperate attempt to stem the tide of white encroachment into their lands in the Ohio River Valley, it inaugurated a war of exceptional savagery — one that continued long after the guns of the Revolution fell silent. Raid and counter raid. Atrocity paid for atrocity. Peaceful Indians were slaughtered and the enraged Indians retaliated with gruesome torture of captives. The populations involved were small, and the war was intimate. Everybody knew someone close to them who had suffered wounds or death or the searing trauma of seeing family members slain. It was an environment primed for the “violentization” of its young men. Sociologist Lonnie Athens’ theory of violentization — the creation of killers — follows four stages: Brutalization, Belligerency, Violent Performances, and Virulency. The Ohio River Valley frontier — and other frontiers to follow — provided ample opportunity for each stage to play out and for young woodsmen to develop, hone and slake “a venomous passion for blood.” These young men became Indian hunters. Such regret would never have crossed Lew Wetzel’s mind. 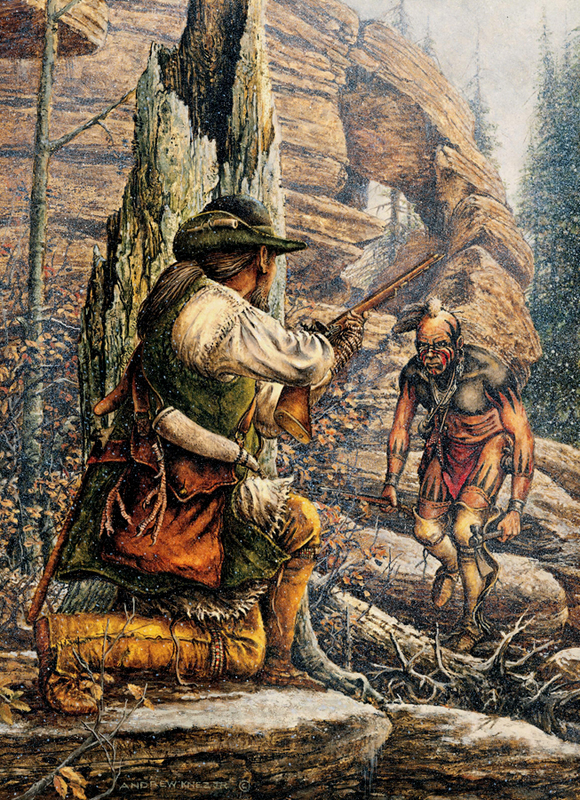 Wetzel’s “brutalization” experience occurred in 1777 or 1778, when the 13-year-old and his brothers were captured by Wyandots who raided their family’s farm in what is now West Virginia. Lewis took a grazing shot to the chest that cut a notch out of his sternum. The wound was painful, but not life threatening, and the Wyandots soon spirited the boys across the Ohio River and into their forest stronghold. The Wyandot were Hurons who had dispersed south from Canada into the Ohio Country by the time of the Revolution. Strong, aggressive allies of the British, they were formidable Frontier Partisan warriors. But these young sons of German immigrants were resourceful. At night they slipped their bonds, stole a rifle, powder horn and shot pouch, and escaped back across the river. Within a year, Lewis had expressed extreme belligerency and had begun to enact “violent performances,” participating in several counter-raids against the Ohio Indians and taking scalps. By his mid-teens, Wetzel was an expert woodsman and a formidable forest warrior. He was exceptionally athletic, standing about 5-feet-10-inches and solidly built. He was renowned for fleetness of foot, which would serve him well in his encounters with his foes. His brothers, Jacob and Martin, were scarcely less capable. The frontier society in which Wetzel grew up considered the killing of Indians a public service, akin to the extirpation of wolves and other apex predators. His exceptional ability as a killer made a socially awkward teenager stand out as a man among men. That sort of reward for violent performance swiftly leads to “virulency.” And Lew Wetzel became a most virulent slayer of Indians. The hunt became his ruling passion. He had hunted armed men long enough and liked it and he would never really care for anything else thereafter. In 1781, he joined Col. Daniel Brodhead’s military expedition against the Delaware. Many Delaware were hesitant to commit to all-out war against the Americans Brodhead, a Continental Army regular, hoped to secure some kind of peace or neutrality. But when two chieftains arrived by canoe at the American camp to negotiate, Lew Wetzel, just into his 20s, walked up behind one of them and sank a tomahawk into his skull. This murder enraged Brodhead, but his militia contingent, which made up about half his force, lauded Lewis for the deed, and Broadhead did not have the confidence — or firepower — to arrest the young Frontier Partisan. For a majority of frontiersmen, peace would come when the Indians were driven entirely out of the country — or exterminated. This exterminationist mindset allowed for no “friendlies” and the cold-blooded slaying of a peace envoy was not considered by most frontiersmen to be any kind of crime. Lewis Wetzel did not relish serving in such organized militia expeditions. He was not amenable to military discipline — a signal characteristic of the Indian Hunter — and, in any case, he was more effective alone or with a small party of other capable Frontier Partisans. As a “Free Ranger” he repeatedly crossed into the Ohio country for days or weeks at a time, always on the hunt. His prowess was extraordinary. Loading a flintlock muzzleloading rifle is a cumbersome, multi-step process. Wetzel mastered reloading on the run. This was accomplished by dropping a charge from the horn into the barrel, then spitting a sub-caliber, unpatched ball down the bore and giving it a good slap at the breech to force a trickle of powder out through the touchhole into the pan for priming. (A brief depiction of the running reload can be seen in the final chase scene in “Last of the Mohicans,” 2:57 minute mark below; looks like he spits the ball then actually primes from the horn. Supposedly Daniel Day-Lewis — whose appearance in LoM is very similar to how Wetzel was described, trained himself to do this for real. When I was a flintlock shooter I could load on the move, but not at a full run. A LOT of spilled powder goes into that bit of training). In one famous incident, Wetzel used this ability to escape from four pursuers in the Ohio forest. He shot one, and the others closed in on him, knowing his rifle was empty. Lewis ran like hell. The surprise for the warriors must have been awful when he whirled around and fired again. That ain’t supposed to happen. The sub-caliber ball rattling around in the barrel would have obviated the accuracy that rifling and a tight-patched ball offered; the running reload was strictly a point-blank range proposition. Wetzel shot down a third pursuer with the barrel of his rifle against his victim’s chest. The fourth warrior wisely gave up the chase. “The False Gobbler,” by Andrew Knez, Jr. It’s virtually impossible to separate fact from folklore when it comes to the Frontier Partisans of the Virginia borders. As the story goes, an Indian in the vicinity of Wheeling was luring white hunters to their deaths by making a false turkey gobble. Wetzel went hunting and brought back the scalp of the “wild turkey.” A very similar story was told about Jesse Hughes, another Northwest Virginia Indian Hunter of the same period. 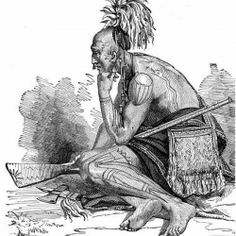 It is probable that some such incident or incidents occurred, and were attributed to famed frontiersmen as a means of demonstrating their prowess, their ability to “out-Indian” their foes. It’s hard not to admire Wetzel’s fieldcraft and martial skills. He was, beyond doubt, a badass among badasses on the border. But his singleness of murderous purpose, which led to the writer Robert E. Howard (no shrinking violet) to call him a monomaniac, is unsettling. The man was a killer, and he liked it. He grew his hair very long, a taunt to those who sought his scalp. He had no fixed abode, no labor other than some market hunting and occasional guiding/protection of land speculators and surveyors, no steady woman. He lived to hunt his foe. He did play a good fiddle though. In 1787, his father John and brother George were killed by Indians — shot from ambush as they paddled a canoe on the Ohio River. A thirst for vengeance for these slayings only added to Wetzel’s virulency. This George Washington (Tegunteh) is a trusty confidential Indian…. He is well known to Governor St. Clair, and I believe there is not a better Indian to be found. The villain who wounded him I am informed is one Lewis Whitzell. I am in hopes to be able to apprehend him and deliver him to Judge Parsons to be delt with; but would much rather have it in my power to order such vagabonds hanged up immediately without trial. Harmer dispatched troops to arrest Wetzel where he was staying at Mingo Bottom, but he and his fellow frontiersmen thwarted the effort, planning to ambush the flatboat carrying the soldiers. They were willing to kill to protect one of their own, and they were not in the least overawed by American officialdom. Harmer’s men finally caught Wetzel at the home of a friend, and they brought him back to the fort in irons. When the removed the irons from his legs so he could exercise, the powerful young athlete promptly sprinted off int the woods, where the soldiers had no chance of catching him. He escaped and evaded, crossing the Ohio back into Virginia, where a sympathetic blacksmith chiseled off his manacles. Sympathizers gave him a rifle and shot and Wetzel headed downriver to Kentucky. He was apprehended again when soldiers spotted him in a tavern in Maysville. It reportedly took a half a dozen men to subdue him. He was jailed across the river at Fort Washington, near modern Cincinnati. A mob of 200 armed frontiersmen soon assembled, demanding his release. Among them was Simon Kenton, the most respected Frontier Partisan in the district. Kenton was close to Martin and Jacob Wetzel, who often ranged with the Kentucky militia known as Kenton’s Boys. Simon Kenton might not have been the kind to gun down a peaceful Indian in cold blood, but he also wasn’t the kind to let the army take one of his own to hang for the deed. A judge released Wetzel on a writ of habeas corpus — with no intent of ever calling him back for trial. After that, Wetzel left the country. He headed down into Spanish Louisiana, where he may have been involved in counterfeiting and spent some time in a Spanish prison. Recently uncovered evidence indicates that he signed on with Aaron Burr’s filibustering project to establish a new county in the southwest. He died in 1808, in Mississippi, possibly of yellow fever. Frontier warfare was vicious and ferocious. Both the American frontiersmen and the British Rangers and their Indian allies committed what would be considered today to be war crimes. The nature of frontier warfare is that of the blood feud, and the longer it goes on the more cruel it becomes. We only have to look to Syria or Ukraine or Nigeria or… today to see that when armed gangs of men go at it, things get extremely nasty. Yet Lewis Wetzel’s bloody career still stands out. 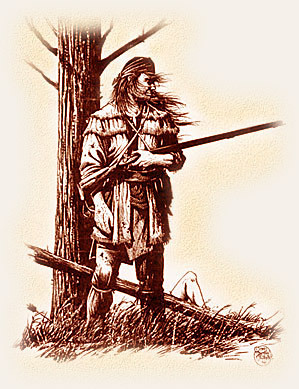 Contemporaries like Kenton or the Ranger Captain Sam Brady (who sometimes ranged with Wetzel) were his equals as combat athletes and woodland warriors. They were expert practitioners of brutal frontier guerilla warfare. But no matter how rough they got, they never plumbed the depths that Wetzel did. They were stable men of stature in their communities, and their efforts were bent toward protection of those communities from a very real threat. Wetzel was a restless, rootless, wayward soul. That says something. Wetzel certainly killed several dozen men, sometimes in combat, sometimes in ambush and sometimes in pure cold-blooded murder. He was an extremely violent product of an extremely violent time, but he was more than just a man of his era. The times gave him scope for an exceptionally well-developed taste for the most extreme blood sport: the hunting of armed and dangerous men. I think Wetzel did what he did because he liked it, and was perhaps addicted to it. It was not about protection or revenge. Killing Indians was fulfilling to his very being. It was who and what he was. If you’ve got time for 40 minutes of crazy, check out this video. Richard Kelly Hoskins is an Identity Christian activist, anti-Semite and white supremacist. He loves him some Lew Wetzel. Calls him a “Phineas Priest,” which is his term for a kind of “vigilante for Christ.” He works himself into a bloodthirsty froth over the “2,000 Indians” Wetzel supposedly personally killed. That’s laughable — that would be close to the entire fighting force the Ohio tribes could muster in the 1770s,-80s. Still, it’s interesting to see the sort of folks who can, today, look upon Wetzel as an unambiguous hero. Is this an excerpt from Warriors of the Wildlands? I got the message to give you my info for shipping today. Carlos Hathcock had a copy of the book with the Hemingway quote. Underneath, he wrote “the hunting-not the killing” I’m not sure Wetzel would have thought that. While I think people who live in safety and security are to quick to judge the actions of those who don’t, Wetzel was definitely a psychotic killer. Maybe if he had been born in another environment he would have been different. Or maybe he would have been an early Jack the Ripper. I really wish people wouldn’t use my religion to justify racism. This is an entirely new piece. Yeah, I think Wetzel liked the hunting AND the killing. That Hoskins dude is a piece of work. Good, the book will be completely new to me. Hemingway’s quote must be understood in the context of a disciplined individual or force. Wetzel lacked any–his behavior appears deranged at best. Police officers routinely hunt armed men, and the chase is both thrilling and dangerous and addictive, but the discipline piece is critical because it precludes murder and becomes the glue for a just society. There are many, almost exclusively unfounded, accusations that today’s law enforcement has gone the way of Wetzel. Not so. What actually drove him to what, in some of the examples given, can only be described as murder? It’s indecipherable. It’s the embodiment of anarchy reigning in the individual. Not submitting to discipline, either external or internal, does not recommend a man, no matter his prowess. He is precisely the kind of human, a man reeking havoc and destruction without pause or examination, or any evidence of moral necessity, who needs confining in the strictest sense. Great piece, Jim. Not submitting to discipline, either external or internal, does not recommend a man, no matter his prowess. I believe that is the key to the lock right there. I’ve been researching several “Indian Hunters” — Wetzel, his contemporary Jesse Hughes, John Joel Glanton, and an Arizona rancher named John B. Townsend — and not one of them could abide organized action or discipline. Townsend was fired as a scout by Gen. George Crook. Hughes was a difficult and unpleasant individual on all levels. Glanton was just a criminal psychopath. You have to wonder how some of those people would be in a different environment. Would Wetzal, Glanton, et cetera grow up to be decent, upstanding citizens or would they have been serial killers? It’s a question of heredity vs. environment. That’s to say nothing of the great wild card free will. Glanton I’d say for sure was just a bad seed. Wetzel I’m not so sure about. I think his society did shape him, giving positive feedback for violent acts. Maybe his taste for killing would have remained latent under other circumstances. He remains elusive to me. What distinguishes Wetzel from classical psychopaths like Glanton was his tight focus, which he retained until the end (though his end was obscure. Most psychopaths become “disorganized”in psychological terms. They start out well disciplined, then slack off until they are easily overcome by authorities or primitive enemies. Not Wetzel. When it comes to such extreme, sustained displays of violence performed under the threat of personal harm, I just can’t see that any of those men being model citizens in “another life”. Genetics aren’t destiny (#NotAll! ), but we are finding more and more evidence every day that behavior (and especially mental illness) is heritable. Wow — spot on with Ben Lilly. Same mentality, different prey. Didn’t think of that. Love these campfire confabs. No doubt some Indians were of this stripe themselves. That HAS to be true, and lost to the historical record. I was thinking about that very thing, and the only on-the-record thing I could come up with was Geronimo saying that his big regret in life was not killing more Mexicans. OBVIOUSLY Geronimo had this for Mexicans, but he DID at least have some very traumatic motivation for that. As for Injun Psychos in fiction(novel and mini-series! ), you fellers remember the sinister Blue Duck??? Just a few notes about the Wetzel family: Their family came from Preuschdorf – long times seen as part of the German countries (remember: Germany was not unified until 1870), Preuschdorf belongs since the times of Louis XIV. to France. It’s located in the East of France, in Northern Alsace, close to the German town of Karlsruhe. The Wetzels (and the Bonnets, as far as I know) came in 1831 with the ship “Britannia” to America. Why I am writing all that? First: Distance from my hometown to Preuschdorf are only 120 km, it’s close by, so to speak. And my familiar German dialect is related to the patois spoken in Northern Alsace. Second: I read in my younger days the books of Zane Grey and some German authors who wrote about the “dark + bloody grounds”, especially “Das Grenzerbuch” from Friedrich von Gagern. Third: Wetzel is just a spooky figure, with his pockmarked swarthy face, with dark hair down to the hips, some feathers braided in and a fresh scalp at his belt, still drenched in blood – spooky, yes, but fascinating, too, to be honest, because of his famous and nearly unbelievebale longhunter skills. Hey, in our younger years we tried to do his reloading on the run – it brought me only some bleeding teethridge from the muzzle of my Spanish-made longrifle replica. Fourth: I think Lewis/Ludwig Wetzel was ambiguous. Here the fighting man, esteemed from (or by?) his peers, there the ruthless murderer. But: I never understand his turn to his long killing spree. He was an Indian captive, received a minor flesh wound, escaped – so did a lot of other folks WITHOUT to develop his kind of bloodthirst. And that means: It was in him. He must have had this tendency to be or the get a psychopath. The dead of his father was later, by that time Lewis Wetzel was a killer long ago. Besides Wetzel (or Glanton, he must have been without any scruples completely, if you can conclude from “Recollections of a Rogue” from Samuel Chamberlain). l think there were another real worse people in these early days – I mean “Little Harpe” (Wiley Harpe, probably borns as William Harper) and “Big Harpe” (Micajah Harpe, probably borns as Joshua Harper). And if you look closer to some of the deeds of young Jesse James, you will feel the cold as well. This is just outstanding. thank you for the contribution. And I hear you about the dangers of taking the muzzle of an octagon barrel in the teeth trying to spit a ball down the bore. The Harpes need a post. They were seriously bad news. Again, Matt, thanks so much for this contribution. Welcome to the campfire.